THAT is awesome nice work man! Polk Audio 4"x6" speakers - +/- $40.00, lots of holes drilled = free. That may just be the trim panel, it is a bit wider than the piller. I have done this on all of my single cabs. How is the speaker mounted? Kinda depends on the speaker. The ones I installed in the pic had a tweeter that was raised about 1/2" above the frame. I cut a piece of 1/2" plywood as a spacer, screwed the speakers to the spacer and then screwed into the spacer through the pillar. I have installed speakers that were flush and used rivets through the pillar into the speaker frame. Well if there is one thing I am ALL about, it's DA BUDGET MODS. Tie downs made out of Angle Iron, bolted to the bed, and under the side rails. And the Aux Input mounted behind the ashtray door. That is freakin great! Do you have any write ups/threads on these mods? Especially the plastic and acetone. Thanks! There is a ton of info on repairing ABS plastic online, but basically, you can either buy ABS PELLETS, or you can take old pieces of ABS (and bust it into little pieces) and melt them in an equal amount of Acetone. They will make a thick liquid that you can use to repair broken or cracked ABS, and it will weld back together. I used it to rebuild the corners broken off my Dash cover, and door panels that were cracked and had holes in them. Last edited by RedBed; 05-03-2017 at 01:31 PM. Drink holder from Pick-a-part - $5.00, scrap metal plate for mount - $0. the 8 position controls and the memory work, only thing i didnt hook up was the heated seats as the controls for them were on the door and werent available to take. (I love this thread and just don't want it to stop. You guys come up with some really good stuff) I finally got around to doing this. I cleaned up the look of my original dash bezel: 2 cans of Rustoleum Plastic Paint with Primer. Thanks smpoulin01. The bezel originally came with the silver-look overlay but it had become nasty over the years. So I just peeled it off and decided to spray it to a different color scheme. But as a matter of fact, me and a buddy will be off to Pick-a-Part tomorrow for half off day. I was planning on taking a page from your book: rearview mirror with lights, license plate lights and finding a drink holder. I was also hoping to find a new washer pump and tank like the mod posted by Jimbonice (post #101). That's the reason I love this thread--there are so many easy to do, LOW BUDGET ideas. I just hope everyone keeps posting as they come up with clever mods. Come on guys and girls, let's keep this one going! Good luck! Hope you find every thing you're looking for. FYI - I got the mirror out of a Buick and got all of the harness I could. supercharge your HEI directly to your junction on the firewall where the alternator keeps the voltage at max. The cost is well under $5 so a very affordable great upgrade. That "link" is now invalid. Is their a correct relay to use with an HEI? 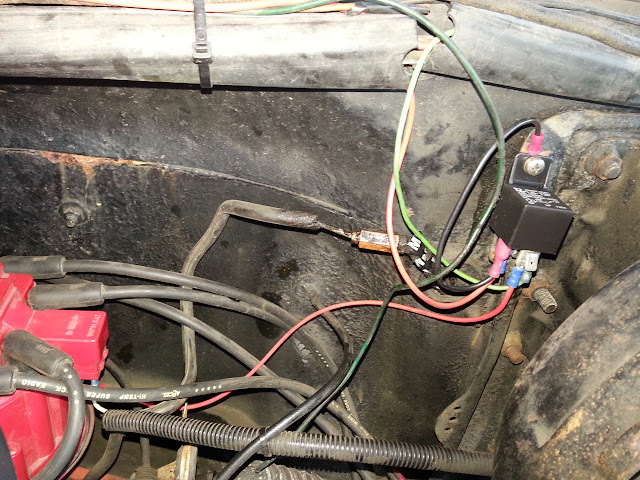 I see the wires going to coil, ground, 12 V supply. Where does the white (or is it green?) wire end up at? Anything else you might be able to share about this install? 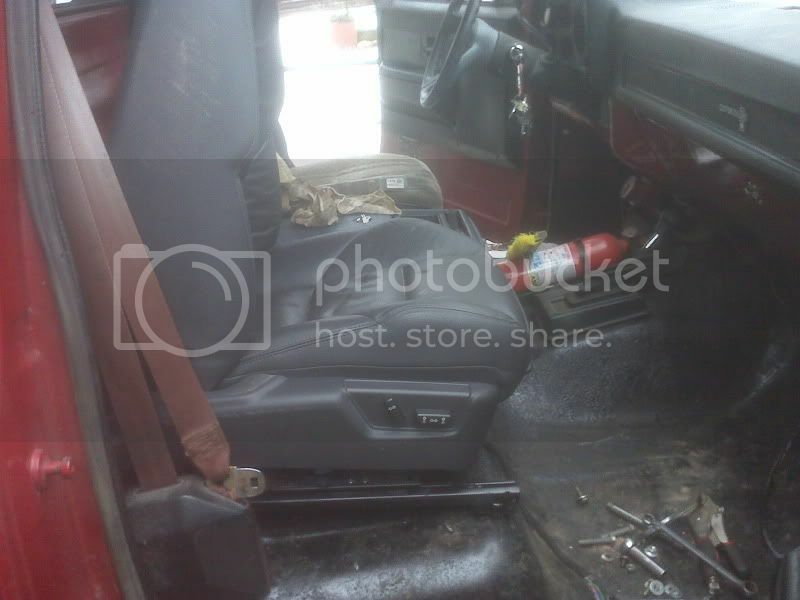 What vehicle did that drink holder come out of? I like it. voltage at my volt meter stills drops to a terrible 9-10V during cranking....but cranks just fine....weird isnt it? The drink holder came out of a 2005 Avalanche. I ordered up one of those Bosch relays. Can't wait to install and try it out! What stands out to me is that is removed some of the hard start firing due to my timing.